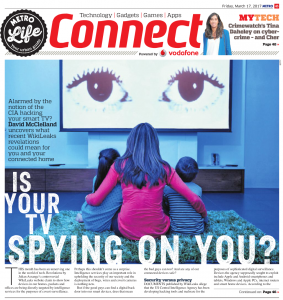 In today’s Metro tech section I shed some light on Li-Fi, a flashy new wireless tech that uses your living room light to help you browse safer and faster. In a nutshell, Li-Fi is just like Wi-Fi except it uses visible light from domestic LED light bulbs to carry data, instead of invisible radio waves from a Wi-Fi router. As I put it in the Metro story, think Morse code on steroids. Of course, using visible light does raise a few questions: many of us do not have our lights switched on during the day, some of our connected devices may sit under a desk in the dark, and rapid flashing or flickering is known to provoke headaches or worse. Professor Haas is the co-founder of pureLiFi, the Edinburgh firm attempting to turn the technology into a viable commercial proposition. Its latest product, the pureLiFi-XC, features a USB adapter the size of a thumb drive with drivers certified for Microsoft Windows, Apple MacOS and Linux. Android and iOS smartphones and tablets are not supported yet, but pureLiFi hopes one day its technology will be embedded into all devices, just as to Bluetooth and Wi-Fi are now. Li-Fi-enabling our light bulbs may prove more of a stumbling block, however. Each LED light that supplies a wireless data stream must be controlled by a Li-Fi access point which, in turn, must be network-connected. pureLifi may need to provide more ingenious ways to minimise the friction of installation if it is to muscle-in on Wi-Fi’s patch, particularly if it is to make waves in the domestic sector. Nevertheless, if growth in connected smart-home and internet of things devices means that demand for radio frequency bandwidth exceeds availability – the so-called ‘spectrum crunch‘ – then technologies like Li-Fi will certainly have a place in our homes and offices of the future. In this week’s Metro newspaper I share my top turntable picks. The ‘vinyl revival‘ is a term coined to describe the resurgent interest in records and record players that dominated the musical youths of me and many others over 35. In fact, record sales recently hit a 25-year high. Technically obsolete behind the CD, MP3 and now online streaming services, vinyl has nevertheless maintained mindshare with those who value the tangible side of owning music – not least the album art – alongside the much vaunted ‘warmth‘ vinyl brings. Indisputably, nostalgia plays a big part of this; cost and convenience? Perhaps not so much. I can tell you that the first 7-inch singles I bought were You Can Call Me Al by Paul Simon and For America by Red Box (wasn’t 1986 a great year? ), but they were pre-dated in our house by shelves of my parents‘ discs – an eclectic mix of folk, country and pop, plus Hancock‘s Half Hour radio comedies like The Blood Donor and (my favourite) The Radio Ham. 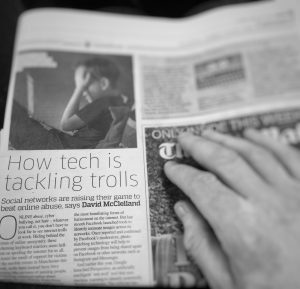 In today’s Metro, I ask how the tech firms are tackling online abuse. Despite the efforts of social networks such as Twitter and Facebook, many of the internet’s most popular destinations remain troubled by trolls. When the trolls are in town, popular social platforms become unpleasant, unsocial places, not a carefree online destination to catch up with family and friends. Some of those accused may claim they are exercising free-speech, but that doesn’t wash if the intent is to cause alarm or distress. Hurling abuse at somebody isn’t free speech, it’s hurling abuse at somebody. So, isn’t it high time that tech firms stepped up their game to tackle the online abuse that runs riot on their platforms? That’s what I examine in How tech is tackling trolls: how artificial intelligence, machine learning and image recognition are being deployed to disarm the trolls who terrorise the web. However, there’s another angle to this that I’d like briefly to expand upon here: social networks need to tackle online abuse not only for their users’ sakes but for their investors’. You see, for online social platforms driven by advertising – which is most of them – it is impossible to ignore the economics of trolling. Social networks are based on the principle that we humans are social creatures who like to express ourselves. The more we share, the more the networks know about us, and the more able they are to sell targeted advertising (ads that are, in theory, more relevant to us) on behalf of their partners. Overall, it’s a happy relationship, and the numbers speak for themselves: almost 2 billion of us log in to Facebook every month to share status updates, likes and photos, from which it made almost $10 billion in 2016. However, fear of unsocial behaviour on social platforms makes us more reluctant to express ourselves online; the less we share, the less they know and the less we visit, so the more it hurts the online platform’s ad revenues. The likes of Facebook and Twitter make nothing if we’re too afraid to use them. There are other ways in which the economics of online abuse can hurt too. Last year, Disney dropped its plans to buy Twitter over concerns that widespread trolling and bullying on the platform might, according to Bloomberg, ‘soil the company’s wholesome family image’. It does: just ask Leslie Jones, Katie Price, Zelda Williams, Katie Price, and countless others who have made the news after leaping from the toxic platform, having unwittingly stirred the trolls’ nest. So, clamping down on unsocial behaviour is an obvious investment for businesses that rely on us being socially generous. As I explore in the Metro feature, technology can go some way to weeding out abuse, but the trouble with automated tools is where the boundaries blur between abuse and robust argument. Even human moderators struggle with this and, for a while yet in my opinion, it’s likely AIs will too. Metro Connect: HACKcess All Areas? Last week’s WikiLeaks document dump professes to reveal how the CIA has – with help from agencies including MI5 – been collecting and developing an arsenal of hacking tools, exploits and cyber skeleton keys to pick its way into the devices we use every day. We shouldn’t be surprised. Covert surveillance is a tool widely used by intelligence agencies to maintain national security and counter terrorism. The Apple Watch launched less than two years ago. 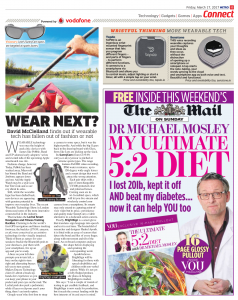 I know this because on the day of the launch I confidently declared that ‘wearable tech is the next big thing’ on stage at the Gadget Show Live, enthusing about the upcoming Pebble Time smartwatch and the latest Jawbone and Fitbit gear. Less than two years on and the wearables phenomenon has failed to catch on, leading analysts to rein in their optimism. Back to the Apple Watch. Many – myself included – saw the launch of Apple’s highly-anticipated wearable as a watershed moment. Indeed it was, but rather than sparking a wearables revolution it had the opposite effect. ‘Oh, is that it?’, was the consensus. However, as Bill Gates once quipped, we tend to over-estimate the impact of a technology in its first two years but underestimate its impact in ten. It might be in the depths of the trough of disillusionment but I can’t see anything other than wearable tech to playing a huge part in our future. 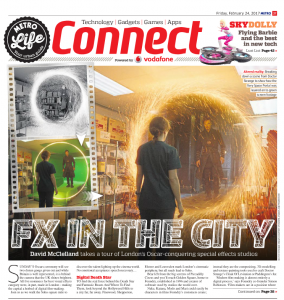 In today’s Metro I embark on a tour of Soho to see how London’s Oscar-winning visual effects firms are lighting up cinema screens around the world. Central London is home to many of the movie world’s most innovative visual effects firms. With the 89th Academy Awards this Sunday I wanted to understand more about what goes into making VFX-heavy Hollywood films. 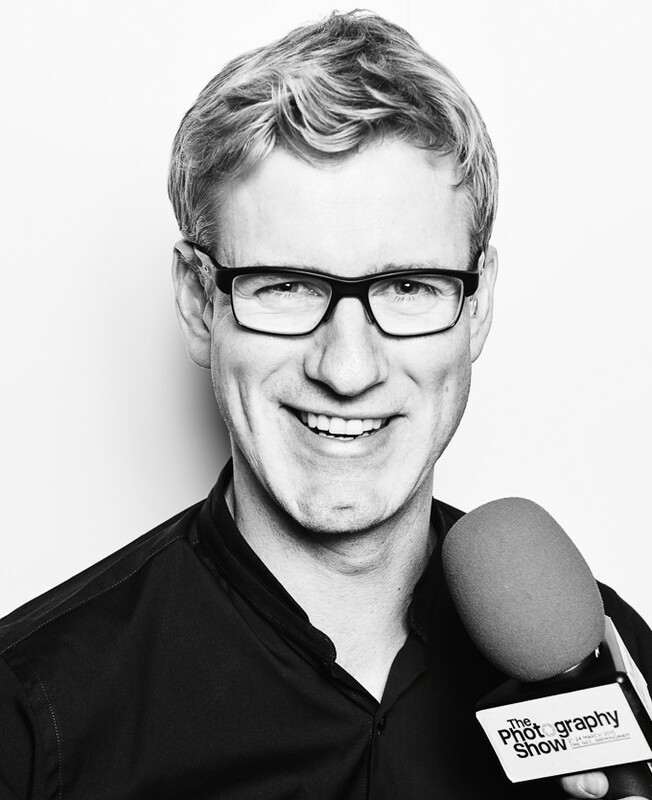 In researching the feature I spoke to Foundry co-founder Simon Robinson. His company’s software titles Nuke, Mari and Katana are used by post-production houses the world over – in fact, every film nominated for a best VFX Oscar in the last six years has used its software. I also spoke with Matt Fox, joint MD for film at Framestore; his team worked on year’s Best VFX Oscar nominee Doctor Strange as well as 2013’s six-time Oscar winner Gravity. As well as talking technology I also learnt about the immense manpower required to turn around a typical movie, and ethics around the digital character resurrection that saw Peter Cushing and Paul Walker brought back to life for the big screen. The 2017 Oscars take place this Sunday 26th February 2017, with five films nominated for Best Visual Effects: Doctor Strange, Rogue One: A Star Wars Story, Deepwater Horizon, The Jungle Book, and Kubo and the Two Strings. Read the full story in the Metro e-edition here. A challenge as a technology journalist is making sure more complex material remains accessible to your audience without compromising accuracy. With a daily UK readership of 1.895 million the Metro newspaper’s audience is broader than most, so when writing here I’m at pains to check that I’m maintaining clarity without sacrificing substance. An example: faced with an assignment on Digital-to-Analogue Converters for this week’s Connect section of the paper I pitched hard with my editor to include an introductory paragraph to give some background. The format doesn’t normally allow for this, and even though we knew we would lose word-count elsewhere in the piece she agreed. It was the right decision. A DAC or Digital-to-Analogue Converter takes the 0s and 1s from your digital music source – a CD, mp3 or Spotify stream for example – and pumps out the analogue signal necessary for speakers, subwoofers and headphones to function*. You’ll find them in phones, PCs, TVs, DVDs, games consoles, even digital radios – anything that plays audio from a digital source. While this sounds like it should be a consistent digital activity there is variation in the specification of DACs which can result in audio quality differences. Bluntly, the DACs integrated into our devices may not be making the most of the audio source, particular if from high-resolution or lossless audio formats. That’s where an external DAC comes into play, squeezing as much detail as possible from good quality digital audio files. They can also add some extra power to the output too – I for one find the volume on my Apple iPhone 6 Plus a little too soft when on the train, tube or in other noisy environments. There is additional significance here for iPhone owners given that Apple has pulled the plug on the ubiquitous 3.5 mm headphone jack in its newer phones – something these jack-equipped headphone amps can help to work around. Anyway, that’s the background to an On Test piece in which I test drive three class-leading high-end, mid-price and great value DAC options. * I was curious to discover whether purely digitally-driven speakers exist: it turns out they do in theory but are impractical for mass adoption – there are precious few resources online but here’s what Wikipedia has to say about them. A lot of my work right now is around cyber crime and cyber safety. My Hackageddon feature this week’s Connect section in The Metro illustrates some ways in which our online data might be vulnerable. While there are precautions we can all heed and best practices we can each adopt when online – good password hygiene among the most important – we are still at the mercy of the organisations we trust to safeguard our data. Sadly, too many of these have been found wanting, with poor security contributing to the estimated 500,000,000 personal records that were leaked or lost in 2015 alone (source: Symantec). 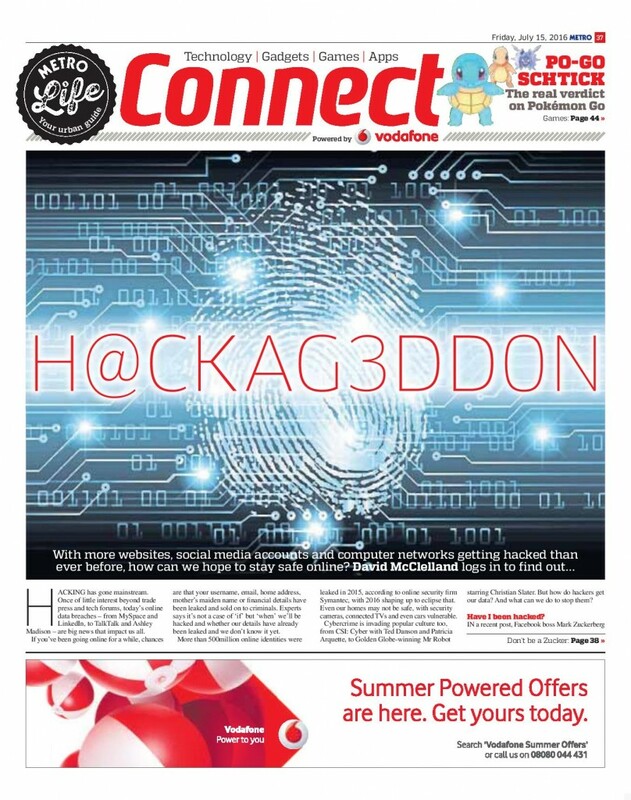 In the Metro feature I look at passwords and password managers, the rise of ransomware, and how to check if your data has already been leaked. We also see how Facebook boss Mark Zuckerberg may take care to keep his details safe now, but how his previous poor security choices recently came back to bite him. 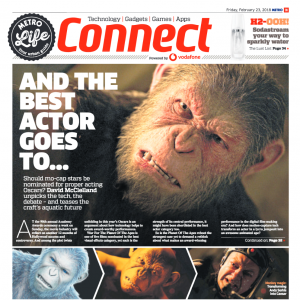 Read the full feature in the Metro e-edition here. As a side note, the feature coincides with season two of Golden Globe-winning cybercrime drama Mr Robot airing on Amazon Prime Video. I enjoyed the first series – it’s a good drama with plenty of technical authenticity – and can’t wait now to get stuck into the second.